I was thrilled when Deepthi of Bindi and Jeans, asked me to write a guest post about Indian fusion potluck dishes.What a wonderful site Deepthi, Ramya, Shweta and Kuki have created, that is dedicated to women! Women like us, who understand the trials and tribulations of immigrating to a foreign land and making it our home. I am lucky to live in a multi-cultural town where I have met many such women who have become my friends and my support system. Many years ago we started a beading and crafts group where we would each bring a potluck dish . Pretty soon we realized that we had become an eating group 😉 Our group still continues to meet with a dazzling array of foods from various cultures! It is like the world on a plate! This is my group of friends who love my Indian and fusion dishes. They encouraged me to start my cooking classes, which I continue teaching to this day. My mother taught cooking classes in India and published two cook books of her own. Based on the solid foundation she gave me in cooking, I feel confident in getting creative with fusion dishes too. So when I make something for the potluck table, it is an authentic Indian recipe that I make to suit the western palate, like the Malvani Chicken or Murg Saagwala, a fusion recipe where I use ingredients available here like in Fiesta Samosas and Avocado Chutney or introducing the Indian flavors to an American favorite like the Tantalizing Tostada bar or Sloppy Joes. One common factor in all my cooking is that I strive to make my recipes easy, healthy and delicious. 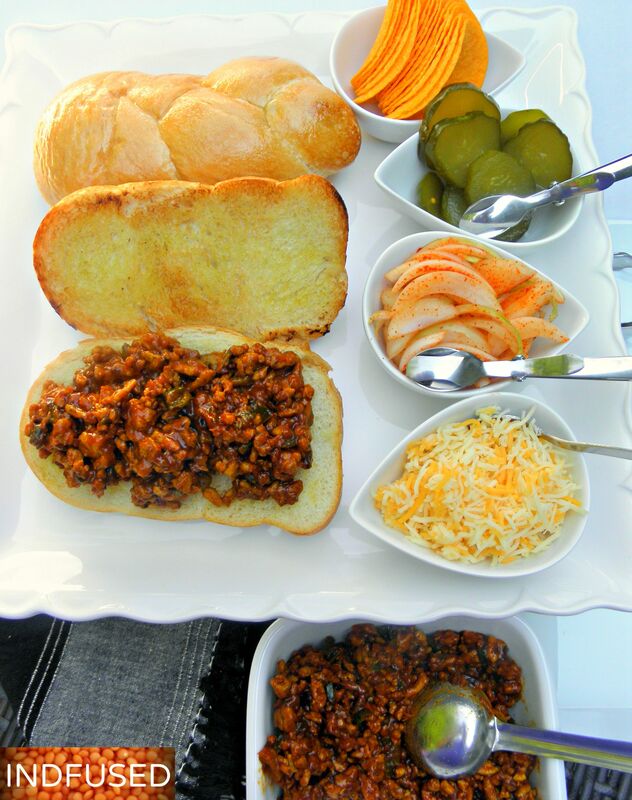 So here is my recipe and step by step instructions on how to make-Not So Sloppy Joes! Bread rolls- I used the Scali crusty rolls with soft chewy insides. Butter and/or olive oil to brush the rolls before toasting. Quickly pickled Indian style onions- Mix sliced onion, sea salt and chili powder to taste! Heat the oil over medium heat and add the ground chicken. Stir the ground meat, breaking the lumps, until the meat is browned about 5 to 6 minutes. Add the diced onion, green pepper and garlic and stir until the onion is translucent and the green pepper is roasted, another 6 minutes or so. Turn down the heat to low, add turmeric, chili and garam masala powders and the all-purpose flour. Roast for another minute. Add the brown sugar, balsamic vinegar, Worcestershire sauce, tomato paste and ketchup. Stir and add the water or stock and the sea salt. Cover and let the mixture cook for about 5 minutes or until the ground chicken is cooked. Butter and toast the bread rolls. Serve with all the fixings! This is a great do ahead dish that can be served at parties with bread rolls or as sliders with a fixings bar. Slow roasting the ground chicken gives this dish a deep flavor. The flavors marry and the chicken ‘kheema’ tastes even better the next day. Refrigerate and reheat the next day. I love this recipe Sandhya. 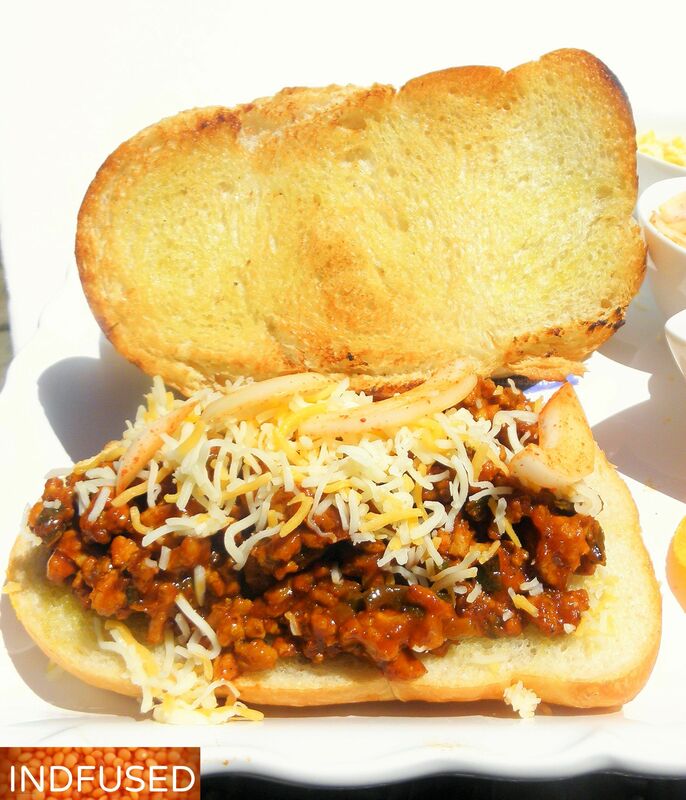 What a wonderful update on sloppy joes! Yum :-). Congrats on the guest post! Thanks Antonia! You are so sweet! It is no small feat for sure Sandhya moving countries and adapting as we go along. I’ve moved across 4 continents and 5 countries, and I believe it has made me who I am today. I can never call any one place home, as I continued to move. You are fortunate to have your friends who share a common thread literally (beading and such) :). Love this recipe, and also love all the fixings. Thank you so much Loretta! I cannot even imagine moving 4 across 4 continents and 5 countries! Wow! You are the truly what they call a ‘cultured’ person. It has made you the amazing person you are. Yes I am lucky to have this multi cultural group of friends in town! Perhaps that’s why I’m so open to new adventures like blogging and meeting folks from near and far, learning about new cultures and forging friendships via this medium…..It is hard when you can’t really call one place “home”, as I’ve never felt completely immersed in any one culture, maybe that’s why I call myself a nomad. It’s sad in a way, but oh well, I feel enriched. Loretta, Just like you, I like the fact that we get to meet so many people near and far thru blogging and I enjoy reading about the different cultures. Your home with your gorgeous garden….that seat at the patio table with a bottle of Vino….that is” home”, right?….Those quite moments when we feel we are’ home’, is what I treasure. I am so honored!!!!! Thank you so much for thinking of me! Thanks Indah! Yes it is so easy to put together. I like using turmeric in my cooking, since it is so good for us, right? That reminds me so much of life in Saudi and meeting these amazing life long friends on the compound! Love the recipe and the story!